If you haven't yet watched Suicide Squad, you should. It's not a flawless film, and the Ghostbusters plot can seem a bit thin at times, but the action is great and a couple of the characters stand out from the rest. Oh, and Target has the blu-ray on sale this week for just ten bucks. 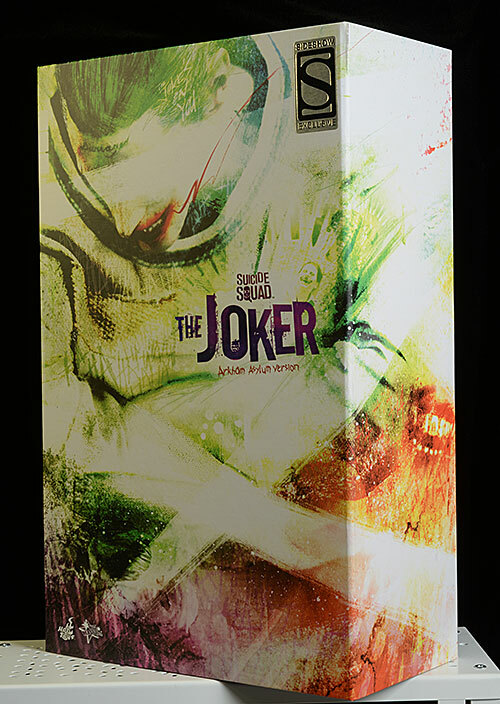 One of the characters that did NOT stand out for me was the Joker. I have no problem with the visual design, including the ink and grill. But the on screen personality just didn't do much for me - I liked Harley far better. This doesn't mean I won't be buying all three versions of the character announced so far by Hot Toys. There's a purple coat version, probably the one most folks will go for. Then there's a tuxedo version, when he's putting on the Ritz. 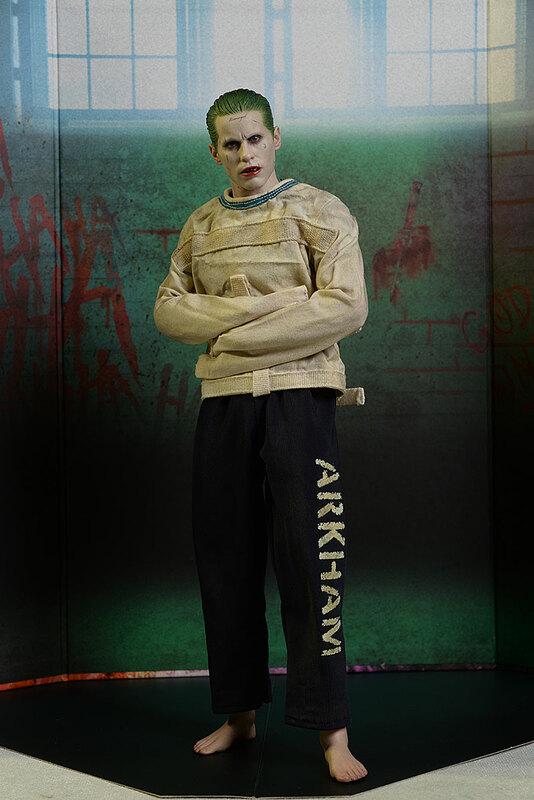 And finally, there's the subject of tonight's review, the Arkham Asylum version. This was an exclusive in select markets, and Sideshow was the only place to get it (easily) in the U.S. He's now shipping, and will run you around $220. The package has an additional feature with the cover. The front and sides wrap around the inside box, and are held in place on the back with magnets (there's no top and bottom to the outer cover). 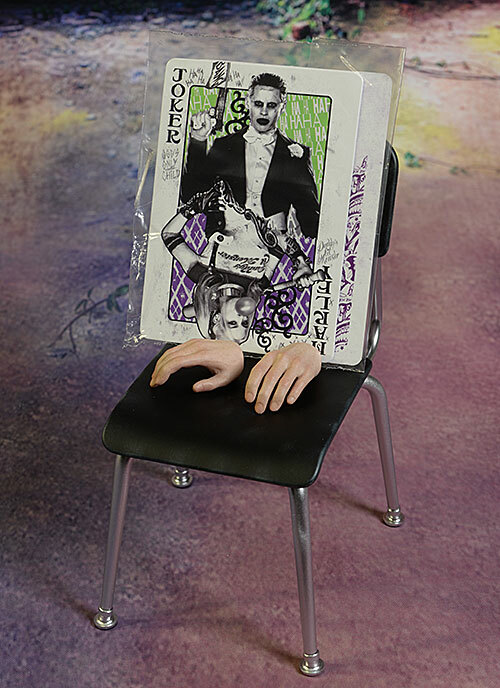 This top cover is made from very heavy cardboard, and can be used as a backdrop to the figure. That's the backdrop you see in the photo above. There's also a small black piece of cardboard for a floor, and the shape of this floor as well as the shape of the backdrop allow them to be used around the included display base if you prefer. In the photo, I skipped the base, just to show it can also be done that way. This is a great concept, and I'd love it if we saw them do it across other lines. This is a much sturdier, well made backdrop then we saw with the recent Vader, for example. The overall package is completely collector friendly as well, no surprise there. 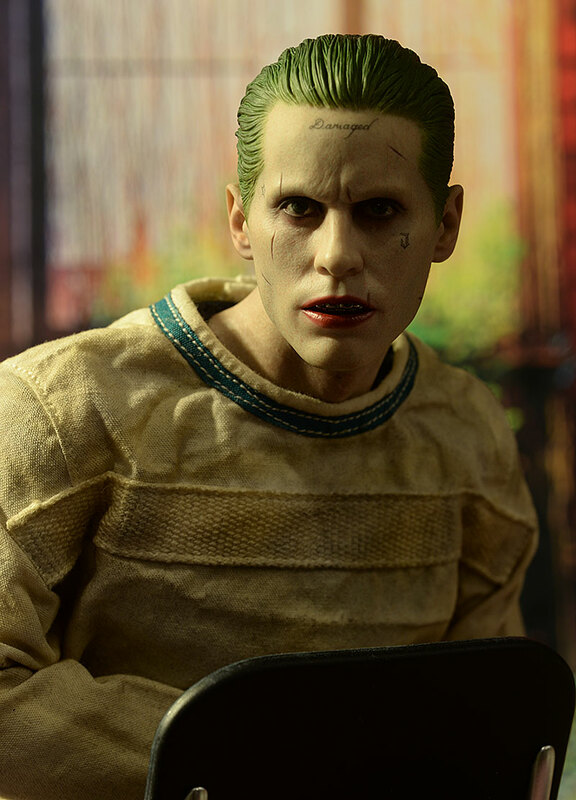 This is one of those Hot Toys sculpts that can easily be mistaken in photos for a real person on initial glance. Of course, it's the hair that ends up giving it away, but even his short cut has a ton of finely detailed strands and a subtle transition to the skin. This Joker is young, and the amount of wrinkling and aging in the skin texture is just about perfect. The realism is exceptional, from the sculpted scarring to his full lips. You don't get much more realistic in sixth scale than this. It's also extremely accurate. 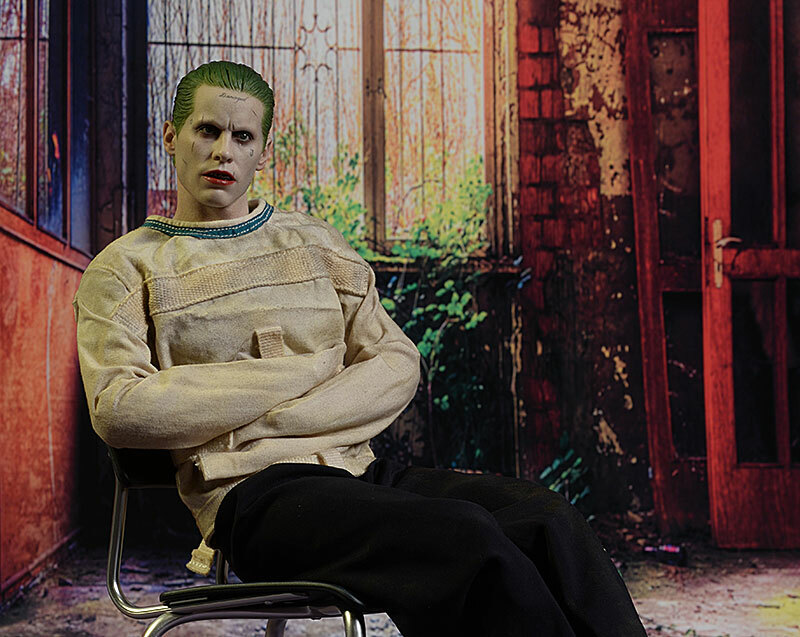 This is Leto as the Joker, no doubt about it. The shape of the head and nose, the underlying bone structure, even the cheeks and jawline, all are spot on. Then there's the emotive aspect. The slightly squinted eyes, open mouth, and tight musculature of the face gives him a subtle yet clear expression. This is how you avoid looking like a mannequin without going extreme. Being barefoot, he's a little shorter than average, coming in at about 11 3/4" tall. Speaking of the feet, they and the ankles/calves are sculpted as one piece, and I'm not quite sure I'm digging them. He's definitely flat footed, and the legs looks...puffy...for lack of a better word. Perhaps it's just a general lack of detail here that's creating the effect. Still, overall this is some fantastic sculpting, and really makes me happy I ordered the other two versions. If they can nail Harley like this, the pair will look amazing together on the shelf. Impressive, my friend, impressive. 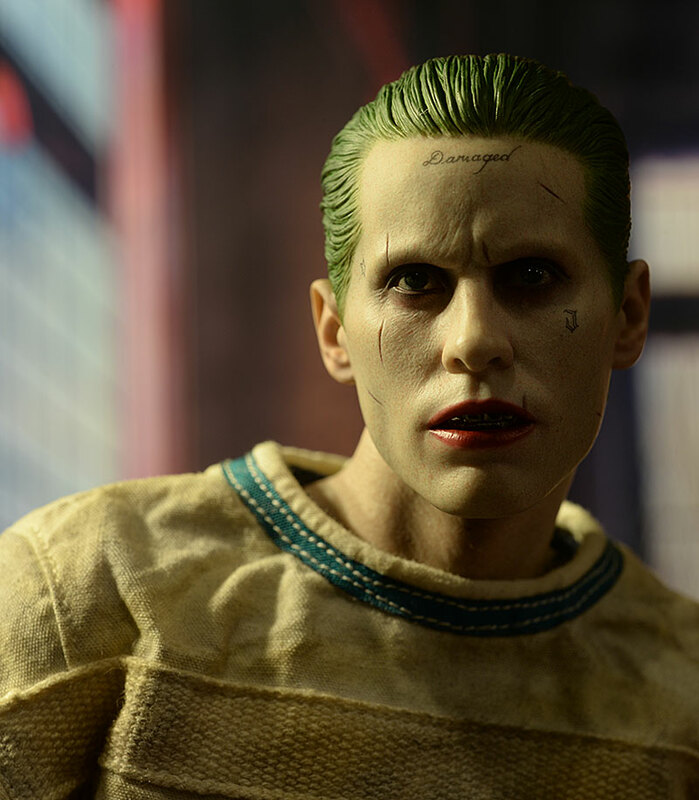 Hot Toys continues to impress with their production paint work, although I do have an issue that I'm hoping is specific only to mine. The hair looks great, especially the transition to the skin. A realistic effect is part sculpt, part paint, and they've nailed it here. The weird skin tone looks good, and translates to the neck, torso, and feet. The 'damaged' and J tattoos are well done, with a slightly faded look that's extremely realistic. The bright lips work for this character, and even the metal teeth are spot on. The only tattoos present on his torso are the cards up near his neck. Since you can't see the rest with the jacket in place, I guess they figured they could skip them. Seems like an odd shortcut for Hot Toys, a company that usually goes for the details like this. So what could I complain about? There's two minor nits, and they pull the score down a half star. First, there's more bleed into the white of the right eye than I usually see with Hot Toys. They've set the bar mighty high, and they have to reach that bar now every time. The second issue is more critical, but I'm hoping it isn't a consistent problem. In the photo below, you can see that under the left eye, within the darker area, there's a small rectangular spot where the dark paint was mussed. I don't know if something was on the mask that blocked the paint when it was sprayed, or if something was stuck to the face and then removed, but at this price point, this sort of error is unacceptable. With the right lighting and angle you can hide it, particularly in hand, but it's still an issue when you spend this kind of money. I've said for years that the single most important joint for getting natural, flowing poses is the neck. There are lots of others that are important, including the ankles, hips, and waist, but if you don't have mobility in the neck, all the other articulation in the world will come up short. This Joker has lots of torso artwork, just like the Purple Coat version. To get the right look the neck and upper body is one piece, and the ball joint is below the jawline. I know some folks don't like this joint, but here it's crucial. It allows for plenty of tilt and lean action, including forward and backward, and you can add a ton of personality to any pose thanks to its design. 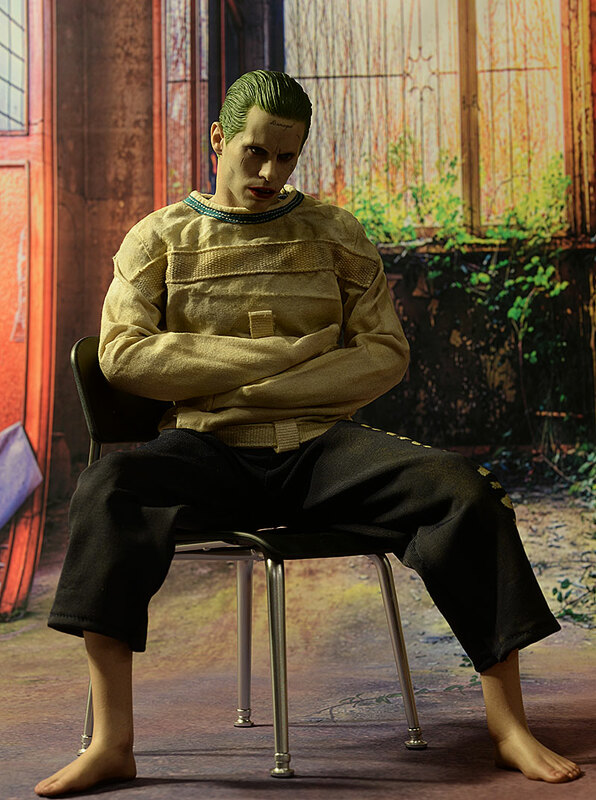 The underlying TrueType has all the usual articulation, and even with the straight jacket in place, you can get plenty of cool poses. Sure, the jacket means the arms are in one pose, but the chest, waist, hips, and knees allow you to create some very realistic looks with the arms crossed. In fact, I almost went four stars here. But the removal of the ankle joints for aesthetic purposes does drop the number of deeper stances he can take. Even in shorter stances, getting him to stay standing can be tricky, since you are unable to make the normal minor tweaks to the ankles necessary to create the perfect center of balance. Ouch. Here's where he takes a pretty serious hit. If you were expecting extras, you'll be disappointed. He does have one set of relaxed grip hands to go with the hands he comes wearing. But that's not quite true, because he is not. Wearing hands, that is. 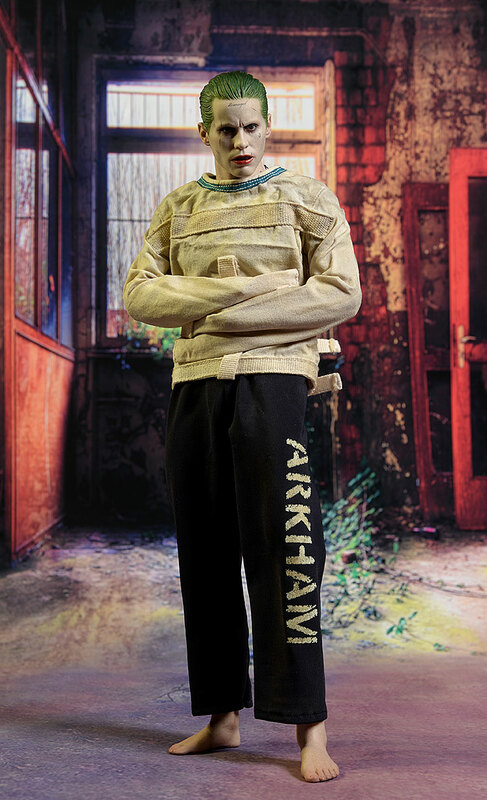 Inside the sleeves of the straight jacket are just wrist posts, no hands. It does give a better look to the line of the jacket, I suppose, but it makes it seem like you're getting something with the hands packed separately that you're really not. There's a couple extra wrist pegs just in case, but I don't think you'll see a lot of people swapping the hands. There's also a plastic chair. You've seen this style of chair a million times, and the design is spot on, but it's just a plastic chair. He does have two full sized playing cards, a prop replica of sorts. I generally don't get too excited about paper extras like this, but it's better than nothing. Finally, there's the display base. The large, basic base has the nameplate and support rod, and can be surrounded by the backdrop if you prefer. It's a nice set up - the base is large enough that he can sit in the chair on it with room to spare - or you can simply use the backdrop on its own. At this price point however, that's light. Really light. 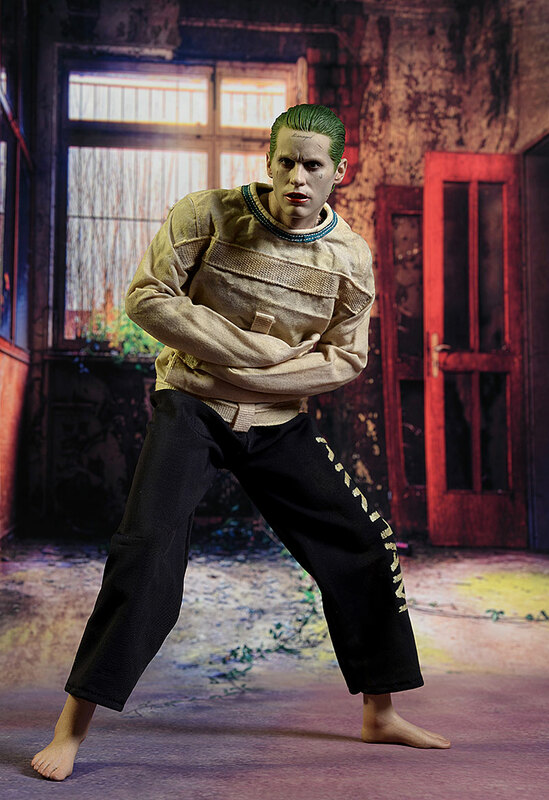 The outfit consists of his prison pants and shirt, covered by a sturdy, heavy duty straight jacket. The shirt remains hidden, but it's nice they included it in case you want to remove the jacket. The pants have the Arkham name on one leg, and match the on screen look well. They are also nicely tailored, and hang loosely around his legs. It's the jacket that earns him the high score in this category. Tight fitting, with multiple metal buckles and straps in back, it has just the right amount of wear and weathering. The fit is extremely realistic too, and it's this realism that really helps create the overall impression of the figure. While he doesn't have much in the way of extras, you can still get a lot of cool looks out of him. The addition of the heavy duty backdrop is nice, and once you get the prison version of Harley, they'll make a great team. No extra hands, a plastic chair...and a stand. A costume that has just pants, a shirt, and the jacket. One portrait. $220? That's a tough price point to justify. This figure is an 'exclusive', but we don't really know what that means in terms of production numbers. I'm betting this guy ends up closer to $180 on the secondary market over the next few months. Taken purely as a figure, this guy deserves a better score. He takes two major hits, one for the lack of accessories, and one for a full price point. At $200, he'd get another half star easy. With a few more accessories, he'd get another half star easy. Even with those issues, this figure might have pulled ***1/2 overall if not for the paint error. Get one with perfect paint and $20 or so cheaper, and you have a four star figure. But combine the paint quality mistake with the high price and lack of extras, and you end up with a lower score than I anticipated. Still, the quality of this figure overall speaks to what we'll see with the Purple Coat and Tuxedo versions, and hopefully the quality of the Harley sculpt will mirror this one. 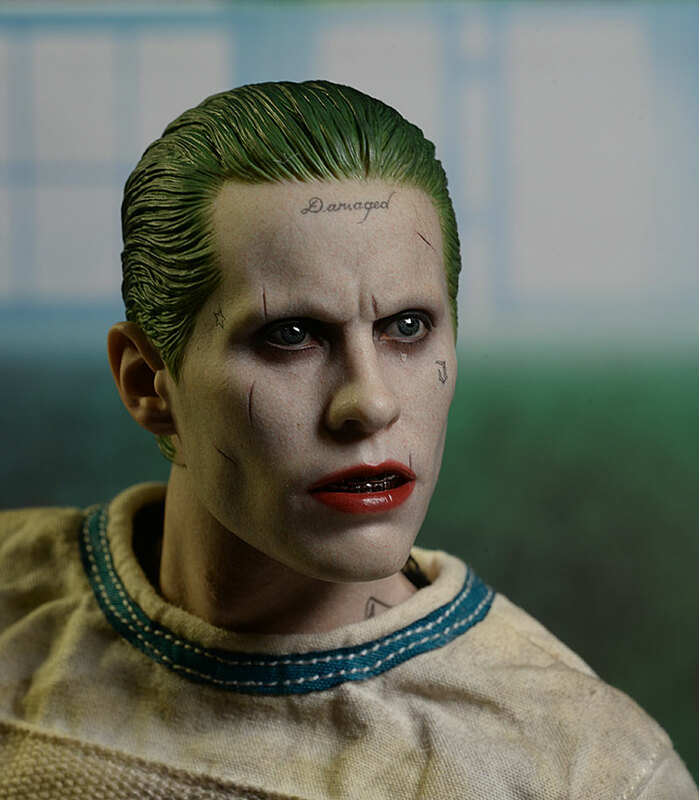 He's clearly not the most critical version of the Leto Joker to have, but if you're a completist you won't be disappointed. - Sideshow has him in stock for $220. I haven't received or reviewed any other figures from Suicide Squad yet, but I have covered both the Knightmare Batman and Armored Batman from Batman V Superman.